Shadow of War wasn’t a game that was brought to my attention very easily as I’m not a huge fan of the Middle Earth series. The only reason I purchased the game was the promise of the Nemesis system. The Nemesis system fills the game with procedurally generated enemies each with their own characteristics, features, abilities, and ranks. The system can create natural rivalries or alliances with certain orcs, or Uruks as the game calls them. These can create unique situations and memorable experiences, at least for the first few hours of the game. While I do have to complain about certain issues of the game, there are some things the game got right. So I’ll list off the good things first. The combat in this game isn’t phenomenal, but it’s precise. Every single move you want your character to make will be executed swiftly and smoothly. 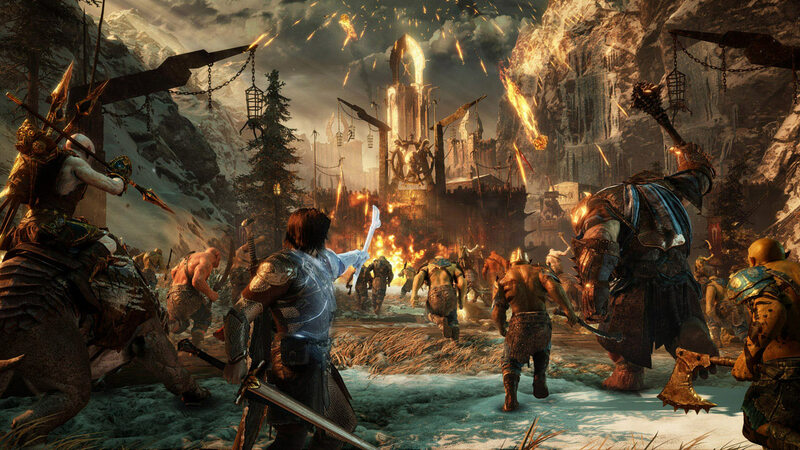 Talion (your character) will strike his blows quickly, building up an “execution” meter that allows you to one-hit an orc in a brutal fashion, although you cannot use this against Captain orcs or higher. However, you can get easily overwhelmed in combat for the first few hours so you might need to rely on stealth before you upgrade but we’ll get to that later. The leveling system isn’t that complicated. You can add 33 skills and 87 upgrades to those skills, although you are only allowed 1 upgrade per skill. As you upgrade combat will slowly start getting easier and easier, allowing you not use stealth as a crutch and slowly use combat more to your advantage. Certain orcs have weaknesses to certain things. Some can be fatally wounded by certain elements or animals, or attacks. Vice versa with their strengths, orcs can be immune to certain attacks or get angrier and do more damage with certain attacks. Traps, such as poisoning barrels, shooting barrels, shooting nets of meat to lure wolf-like things, all are useful and can completely change your situation in combat. Nothing much to say here, graphics look good, sunsets look pretty. Voice acting is good but the characters are shallow as a puddle. I guess that leads me to the bad section. The story has interesting setup and plot development at first but falls flat on its face after the first act. There are certain characters that seem interesting but they are hardly ever seen in the story. You will probably see plot twists come from a mile away and the story is just really short in general. The objectives in story quests are repetitive but still offers more variety than side quests and the nemesis system has to offer. Stealth is a mixed bag in this game. At times stealth can be useful. For example, sneaking quietly behind archers taking them out quietly one by one before you attack a base is pretty awesome. But, more often than not you will be killing captains in this game. More often than not you cannot kill a captain with stealth because they are surrounded by 15 other orcs. So without upgrades, this game can be a total b**** throughout the first few hours of combat. Especially on harder difficulties, as I have already stated. The Nemesis System is this games greatest strength and its greatest weakness. Yes, you will be fighting many different types of orcs that have many different personalities but I can almost guarantee that by your twelfth hour into the game you will realize that you are doing the same quests, over and over again. By act two you will be able to recruit orcs to your own army, but these only add 2 more types of quests to the Nemesis System. This game relies so heavily on the Nemesis System that it falls flat on almost everything else. You can get more loot from captains such as rings, armors, and swords but beyond that no variety other than the orcs you kill or recruit. Each of the 5 regions you can visit is relatively small so expect to be in the same areas often. Once your army becomes big enough you can perform sieges, unfortunately, they are just big games of capture the point. You can summon orc bodyguards! You can ride beasts! You can even ride a dragon! But how will that matter when you will only end up doing the same thing over and over again, the story isn’t what killed this game for me. It’s the unrefined Nemesis System having you carry out the same tasks for eternity. Sadly I don’t think I will be returning to Shadow of War anytime soon.